BANGI, 17 March 2014 – The many cultural and traditional programmes being held yearly at The National University of Malaysia (UKM) by students and staff had not only served to maintain cultures and traditions of the various races but to expose others to them as well. 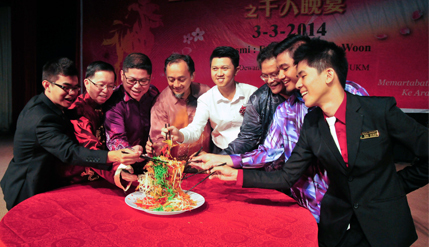 MCA Youth Chief, Chong Sin Woon, speaking at an Ang Pow Dinner held at the Dewan Canselor Tun Abdul Razak (DECTAR) here recently, he said UKM has played an important role in maintaining the country’s national identity through the years. At the same time the many cultural and traditional programmes being held yearly at UKM by students and staff had not only served to maintain cultures and traditions of the various races but to expose others to them as well. Chong also presented a donation of RM10,000 from the MCA to the Ang Pow Dinner organisers in recognition of their role in fostering students’ understanding of the diverse cultures in the country. Deputy Vice Chancellor (Academic and International Affairs), Prof Ir Dr Riza Atiq Abdullah OK Rahmat attended the function.